The Wildcard character is used to signify a dummy character to substitute the actual character in the text. So, ultimately you won’t need to search the actual text but can look up the partial text. 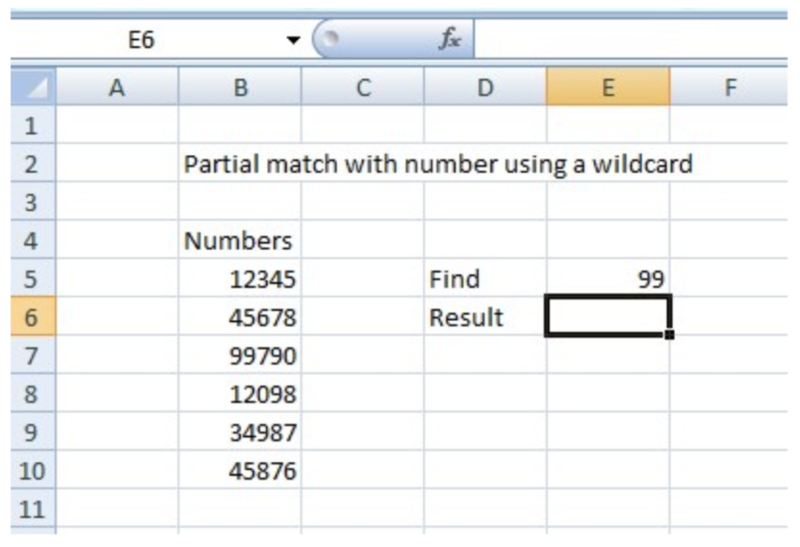 What is a Partial match against numbers with a wildcard in Excel? 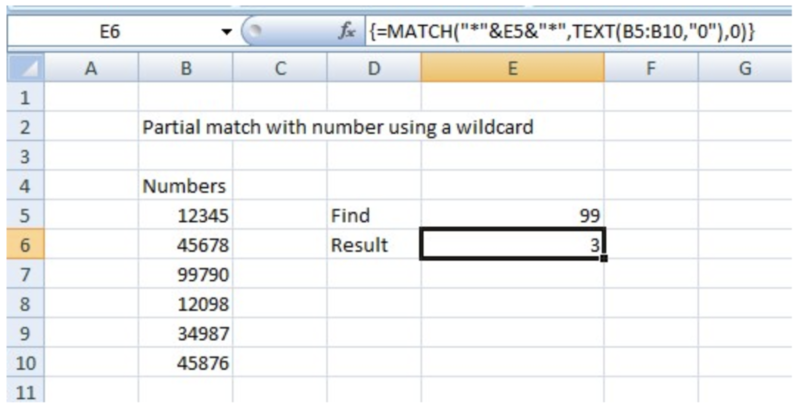 The Partial Match against numbers with the wildcard is done to employ criteria of searching the partial match of the text. The use of the Partial match against numbers with the wildcard is used to perform the partial match against numbers. Hence, you must use the MATCH and TEXT functions for the lookup. The working of the function is explained in the Example. Lookup_value: Required. This is the value to be matched in the array. Lookup_array: Required. It is the range of cells or array reference. Match_type: Optional. It is the criterion which is used for the match, specified as -1, 0, or 1. Format_text: Required. It defines the number format that must be used in the lookup. Construct a table of several numbers and use the array formula based on the MATCH and TEXT functions. You have an option to convert the lookup range to text values if you want to perform a normal lookup with the MATCH and VLOOKUP functions. But, there is another option to use the TEXT function to convert the values within the formula. Now, use the formula as =MATCH (“*”&E5”*”, TEXT (B5: B10, ”0”), 0) and press Control+ Shift+ Enter to apply the array formula. The TEXT function will transform the numbers into text, and the MATCH function will find the partial match. The Return will be given in the respective field as shown in the figure. The default value of the Match type is 1. The match function gives the relative position of the item we are trying to find in the array. The TEXT function is useful when you want to embed the numeric output of a formula and represent it in some other format inside a text. The Format_text must appear in the quotation marks. i need a wildcard for numbers on the left side of the decimal when dealing with rounding up and down with specific criteria but focusing on the right side of the decimal only. Hello, I have been stuck for days on a problem and have searched many boards and have been unable to find a solution. I have two columns. 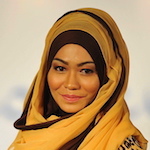 Column A has a list of 1502 partial phone numbers in the format ***-*79-1989 Column B has a list of 1546 full phone numbers for example 304-79-1989. The last 6 digits of the partial numbers in Column A match the last 6 digits of 1502 of the numbers in Column B. I need to find out which numbers from Column B do not match any of the phone numbers in column A.